This book developed out of a leadership course I taught at Calvin Theological seminary. In searching for a text all I could find were volumes that claimed to teach an individual how to be a leader. I'm just not at all sure that is possible. Management can be taught, but do leaders really arise out of leadership seminars and books? Look around. How many leaders in politics or the military or business or the film industry or environmentalism or the church can say their leadership abilities came from taking a weekend seminar? Some say Ronald Reagan was a great leader. Did his leadership come from enrolling in a course or was he naturally a leader for a particular time in history? The same questions could be asked of all the great leaders of the world. Hilary Clinton, love her or hate her, is a leader--a natural born leader. Her leadership skills arise from natural abilities far more than what she might have read in books and articles. 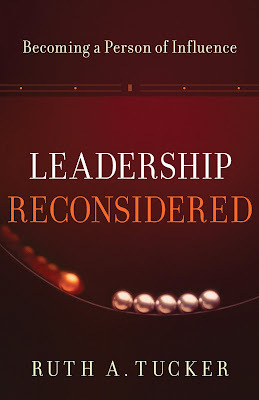 I just finished reading your book Leadership Reconsidered a few hours ago, and immediately googled you to find an email address. Your book was on the syllabus for our Leadership course, and it was the first time I'd heard about you. I would like to say thank you for your valuable thoughts on legacy and the wonderful inspiration you left behind, and continue to do so through your writings. Personally, the second part of the book was not only an inspiration but also a big motivation for me. I'm 20 years old, originally from Brazil and currently studying theology in Austria. As you well know, its not always easy to be a woman in such a course. Our church (I'm a 7th Day Adventist) is currently having a big discussion on the subject of women's ordination, and I often notice the question mark in people's eyes when they hear I'm studying theology. But I'm sure I'm in the right place, where God wants me. I dream of becoming a professor and a writer some day, and reading a bit about your experiences was very inspiring. Thank you very much! May God continue to bless your work and your ministry! Thank you for the insightful critique of leadership theory and practice in your book. I've read dozens of leadership books hardly worth the paper they are printed on. I've also taught servant leadership in the workplace for 11 years and know that several companies here in Dallas have taken it seriously. . . . There's a lot of nonsense about using the Bible as a leadership manual, seeing Jesus as a corporate executive/manager, and reducing leading to steps/rules/principles that (supposedly) can be applied anywhere, anytime. Many churches in Dallas are becoming like big corporations, so I'm writing a similar critique of leadership theory and practice. . . . Thanks again, for contributing something worthwhile.